DEMOCRACY allows for different ideological views, to the extent that some of those views are manifested in the existence of political parties, and only one of them will be in the seat of power. This is the case in our country, where, since 1991, we have seen the existence of opposition political parties which hold ideological views which are at variance to those of the ruling party. However, this variance should not be a source of division between members of the opposition political parties and the ruling party. It is important that there exists a synergy between the leaders of the opposition parties and the ruling party for the sake of fostering development in their constituencies. It is for this reason that elected leaders work with the government of the day to foster development in the constituencies. While drawing their ideological boundaries, the delivery of development is a meeting point which cannot be avoided by either side. 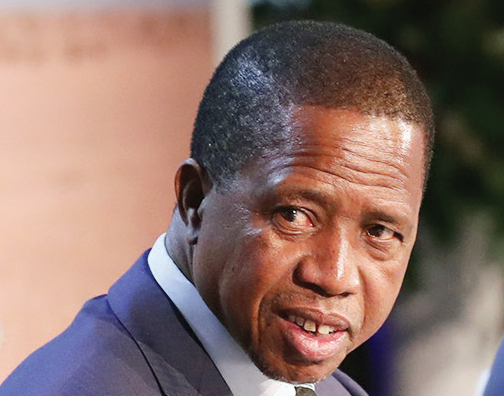 This is why President Edgar Lungu last Friday urged traditional leaders to encourage their elected leaders to work closely with the government of the day. The President said elected leaders, especially those from the opposition political parties, should not isolate themselves if they want to effectively foster development. Mr Lungu said there is need for all stakeholders to work together as opposed to fighting one another. The President was speaking when he paid a courtesy call on Chief Inyambo Yeta, who had expressed concern at the deplorable state of the Kazungula-Sesheke road. The adage that when two elephants fight, it is the grass that suffers holds true in this respect. The deplorable state of the road makes life more uncomfortable for the ordinary people who use it on a daily basis. Leaders are elected to represent the people in Parliament and take development to them when it is needed. In seeking to take development to the people, it should be borne in mind that it is a two-way process that involves decision makers and the recipients, with a representative as a middleman. The middleman can only succeed if he enjoys a healthy working relationship with stakeholders in the ruling party so that he is able to convey to them what the people want and take development to the people. This is why in the past, the ruling party has appointed some Members of Parliament in the opposition political parties as ministers. By this action, it should not be construed that the ruling party seeks to weaken the opposition party by diverting the allegiance of its members to itself, no. The ruling party is only extending a hand of fellowship to the opposition parties to work together and bring development to the electorate. It is wrong to view members of the opposition political parties appointed to ministerial positions in the ruling party as traitors. Such appointees only seek good for their electorate. As the government of the day is ready to work with representatives in the opposition political parties, they should take advantage of the gesture to develop their areas. And this co-operation between the ruling party and the opposition is bound to manifest itself during an election and act as an antidote against any violence. The violence we are witnessing in campaigns in Sesheke is unfortunate and uncalled for. Both parties should realise that theirs is a quest to search for an individual who will enhance development in the area and there is therefore no need to resort to violent acts. Let both parties work together so that we can see development in Sesheke.